I had a impromptu session scheduled with Savanna today, I have been scheduling them that way more often now, but they are therapy for me – and Savanna is always understanding. 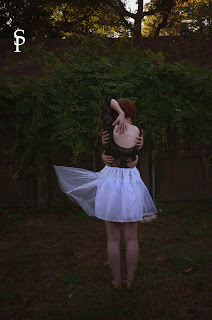 After seeing Brooke Shaden’s post today, I wanted to push myself and try new adventures. I already knew I wanted to go for a ‘Chaotic Ballerina’ theme (I have something in the works and might be working with professional dancers soon, so I am sure this theme will carry on!) and again with Halloween around the corner I wanted to do something…eerie. I think this was the SHORTEST session I have ever had with Savanna but we had limited light and I got caught up with saving a dog right before the session (okay really it was just a lost dog in the neighborhood, but lost dogs always have a place in my heart and I have to find their home). We literally had this session in my back yard, which was also a first! The representation of this photo, to me, is not as eerie as it looks…but you can define the photo how you wish! I’d love to know how it comes across to you or what you feel from looking at it! Feel free to comment! These hands are all Savanna – and to me it represents that no matter what anyone says, that our own personal choices shape who we are and what we become. And while there might be circumstances around us, that we cannot control – how we react to those circumstances, continue to define us. And help mold us into who we are.